Several of us in the Rapid Web Services office are into some quite geeky hobbies, myself especially. 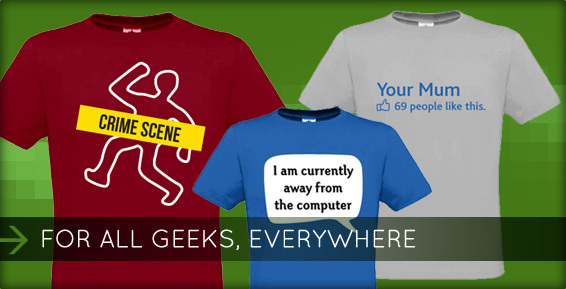 Rapid Web Services is proud to announce the recent launch of Something Geeky, a brand new e-commerce website which sells geek t-shirts and other general geeky products. This e-commerce website is based on our custom in-house e-commerce system, which allows our clients to administrate their products and site options via a secure, custom and bespoke administration suite. This e-commerce system can be customised with new functionality as desired by the client in question. For example, the Something Geeky site shows custom hover effects on product selection, an AJAX powered ‘add to basket’ functionality, heavily customised product pages and a tight integration with a custom themed WordPress installation for covering information about geeky news and new geek t-shirt product releases. The main site and the WordPress installation are covering by a fully custom ‘Something Geeky’ theme and website design which is fully unique to the needs of the client. This design and layout is custom designed to appeal primarily to the geek/gaming audience that the products listing on the website currently target. Something Geeky is a custom e-commerce solution, WordPress installation and full website design and theme bespoke to the needs of the client. If you’re interested in a new website that covers any of these area, feel free to contact us right here!